Adachi Natural Polymers Pvt. Ltd.
- It has excellent penetration & fiber forming property. It is very effectively used for sizing in dyeing & printing industry. - It is also used for sizing in jute yarn & cotton wraps. - It has extensive use in paper & explosive industry, where it is used as viscosity builder. Tamarind tree is a forest tree. They are commonly found all over in India. Tamarind trees requires minimum water as compared to other trees. Tamarind trees are evergreen growing to a height of about 20 to 80 feet. A full grown yields about 175 to 250 Kgs. of fruits. With increase in demand the Tamarind trees are also cultivated now a days. 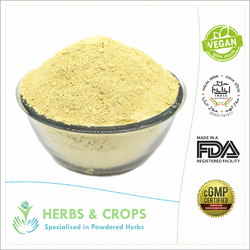 Tamarind Kernel Powder (TKP) is a complex mixture containing a galactoxyloglucan polysaccharide (55-65%), Proteins (18-20%), Lipids (6-10%) and certain minor constituents e.g. Fibres, Sugar etc. Divine Gums & Biopolymers Pvt. Ltd.
We are acknowledged as one of eminent Tamarind Kernel Powder Manufacturers and Exporters in the country. We provide Tamarind Kernel Powder in various grades and specifications as per the requirements of the clients. 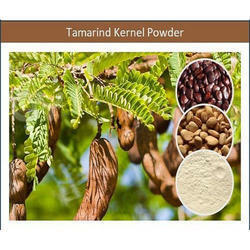 We offer Tamarind Kernel Powder at the most discounted price in the industry.